Have you noticed that more and more kitchens are done in a color that’s…not really a color? Yes—we’re talking about white kitchens. From HGTV to house tours to new construction, we’re seeing white kitchens everywhere. So should you switch over to a white kitchen in your home? 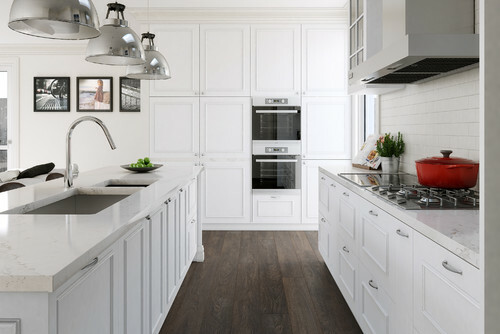 White kitchens are clean and fresh. They wake you up in the morning and give you a shot of energy after a long day at work. They also inspire us to eat healthier—fruits and vegetables just look so good on the surfaces of a white kitchen. There’s also the feeling of gourmet that accompanies a white kitchen, evocative of a chef’s coat and hat. If the all-black kitchen represents the on-the-go urban takeout lifestyle, the white kitchen stands for farm-fresh culinary delight. White kitchens also run the risk of looking too sterile, more like a hospital room than a kitchen. Beware of pairing too much stainless steel or chrome with a white kitchen, especially if you don’t have any color or wood accents in the room. White kitchens can be overwhelmingly bright. Consider your windows and how the sun enters the room. Warm the light with translucent curtains, lampshades, indirect lighting, or even carefully chosen stained glass. And beware of overhead fluorescent lights! What type of seating is best for a white kitchen? 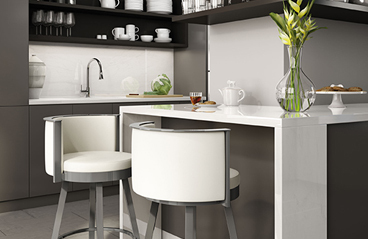 Most French Country stools look fantastic in a clean, white kitchen. Silver finish, brushed steel, or light wood accents on any barstool also works well. You can match the colors of your cushions to your room’s accent colors, but be sure that it doesn’t create too many pops of color. 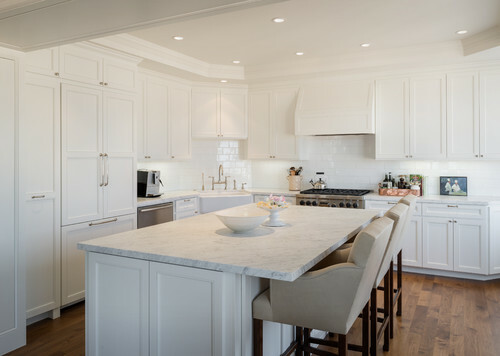 Often a kitchen will be designed without consideration for color from the chairs—so if your white kitchen already has all the color it needs, stick with white, birch, ash, or silver on your chairs. Do you have a white kitchen? Do you think it’s a trend, or will white kitchens look great for years to come? Let us know on our Facebook page here. And if you’re looking for the perfect stools for your white kitchen, we’re happy to help you find them!